A small grroup of members (10) took part in a Club social visit to Crofton Beam Engines and the Wilton Windmill on the Bank Holiday (5th May). The engines were in steam so we were able to see the pumps used to lift water for the Kennet & Avon canal in operation. The weather was fine and sunny although it was a little breezy at the Pump House and also at the Windmill. The volunteers running the steam engines were very friendly and explained the various complexities of the engines and pumps to those who were interested. The Crofton cafe food was sampled together with the various beers and cider available in the bar. Later in the afternoon some of the group made the trip to the nearby Wilton Windmill. This was also a very interesting tour although not everyone was able or brave enough to climb the very steep ladders to visit the top of the tower and examine the interesting arrangement of the lightening conductor (the mill cap is steel and of course has to turn in to the wind!). A good number of members attended the annual Chairman’s Event on Sunday 12th August. It was great to see such a varied collection of boats on the water including, tugs, fast electric and small yachts. The weather was actually very nice after a heavy shower at the start, and we all enjoyed our usual shared lunch in the sunshine later on. Thanks to everyone who help to set-up(and clear up) the Lake for others to enjoy. At the Club Evening Meeting (19th January 2012) two Club members were voted the winners in this year’s Concours D’elegance competition. 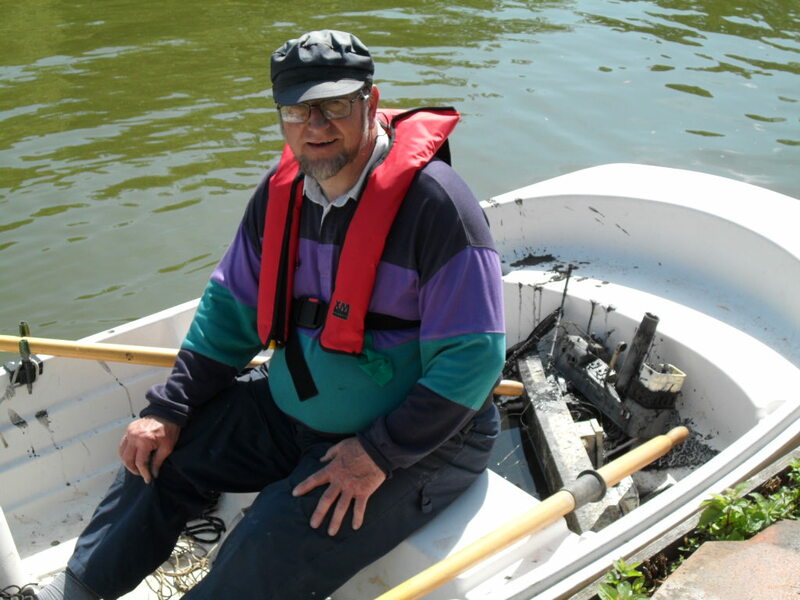 Ian’s boat was subsequently voted overall winner of the 2012 Concours Competition. The Awards will be made at the AGM meeting on 16th February. The diver (Nick Austin) spent a very productive couple of hours at the Park this Saturday. He successfully managed to locate Gus’s Mirror Class Dinghy and Eddie’s HMS Starling. 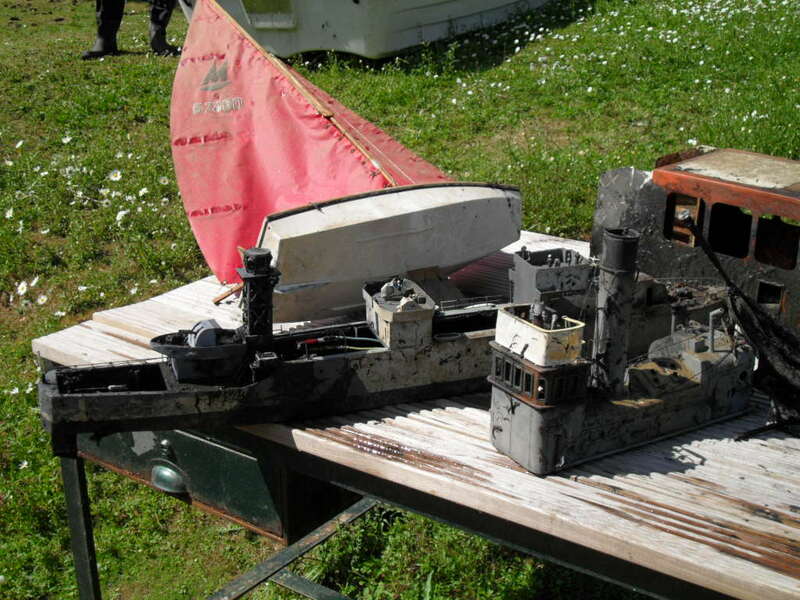 Also recovered were the superstructure of the Chairman’s Osprey Minesweeper and the top of a very large Lifeboat which we think blew off during a traders demonstration at a BP Boat Show a couple of years ago. Unfortunately we were not able to locate the remains of a previous show visitor’s Flower Class Corvette. Many thanks to Nick and Dave Stretton-Smith who arranged for Nick to dive for us and supported him in the rescue boat.